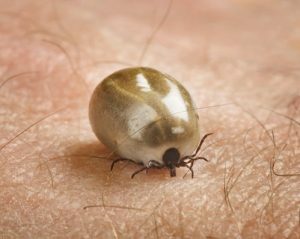 What are the new treatment options for Lyme disease? Some disease ecologists are projecting that this spring and summer will bring an increased risk for Lyme disease in the Northeast U.S. Although approximately 30,000 cases of Lyme disease are reported to the Centers for Disease Control and Prevention (CDC) by state health departments each year, those reports account for only a fraction of the diagnosed cases of the disease. Studies that looked at the number of positive tests for Lyme disease at large clinical labs and the number of insurance claims for clinician-diagnosed Lyme disease put the estimate of annual cases in the U.S. closer to between 240,000 and 444,000. In the majority of cases, if patients are diagnosed soon after the infection, the disease is successfully treated with antibiotics. However, approximately 10% to 20% patients develop a condition known as Post-Treatment Lyme Disease Syndrome (PTLDS). The symptoms of PTLDS include severe fatigue, muscle pain, arthritis, sleep disturbances, headaches, numbness or shooting pain in the arms, face, hands, or legs, hearing and vision problems, Bell’s palsy (one-sided drooping face and eyelid muscles), and cognitive problems. Unfortunately, PTLDS is often misdiagnosed because current tests for the disease do not accurately detect all infections. In addition, diagnosis can be complicated because the disease shares symptoms with a number of other conditions, including arthritis, fibromyalgia, chronic fatigue syndrome, and multiple sclerosis. New uses for drugs that are currently FDA-approved for treatment of other conditions: Researchers at Stanford School of Medicine are looking for drugs that can completely eliminate the bacteria Borrelia burgdorferi, which causes Lyme disease, in people newly diagnosed with the disease. They tested more than 4,000 drugs on the bacteria in the lab and chose the 20 that were most effective at destroying the bacteria at the onset of infection. A “pulse” approach to antibiotic dosing: Researchers at Northeastern University found that some cells of the bacteria that causes Lyme disease lie dormant. Antibiotics only kill active cells, so these cells persist and become active after the antibiotics are no longer in the system. In conjunction with Tufts University School of Medicine, they are exploring what they call pulse dosing of antibiotics. Antibiotics are given to eliminate the active cells, then repeated at a given interval to kill the dormant cells as they become active, but before they being to reproduce. Combining antibiotics for more effective treatment: Another approach to eliminating the Borrelia burgdorferi bacteria that persist after initial antibiotic treatment is under investigation by researchers at Johns Hopkins Lyme Center. By combining current FDA-approved antibiotics, researchers found that more of the dormant cells were cleared than were cleared by the standard treatment of doxycycline. Creating new drugs from soil bacteria: Researchers at Northeastern University’s Antimicrobial Discovery Center are extracting new drugs from bacteria that live in the soil that may open the door to new treatments. A health advisor can help you learn more about Lyme disease treatments and clinical trials of new approaches to treating the disease and provide the latest research. An advisor can also connect you with top specialists who can diagnose and treat the condition. Use tweezers to carefully remove the tick by grabbing under its head and pulling out the mouth that’s embedded in your skin. Don’t squeeze the body of the tick, because that can cause it to transfer the bacteria into your bloodstream. Seal the tick in a plastic bag or container and bring it with you to the doctor. Your doctor may want to have the tick tested to see if it carries Lyme disease. Since it’s important to start treatment as soon as possible if you have been infected, it may be wise to see your doctor as soon as possible after being bitten. If you’ve been outdoors and develop an expanding red rash, fever, or flu-like symptoms, even if you didn’t see a tick embedded on your body, see your doctor right away for diagnosis and treatment.